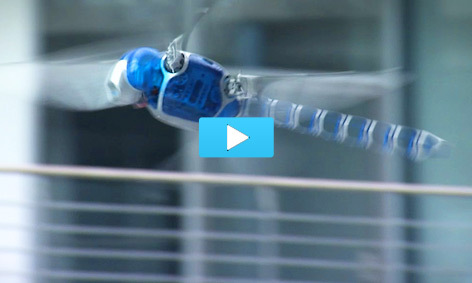 For Festo's presentation at the Hanover Fair we have developed the Bionicopter – a dragonfly-robot inspired by nature. The Bionicopter masters the very complex flight quality of the dragonfly. This ultra-light flying object commands maneuvers in all directions, hovering on the spot and the gliding flight without beating it's wings. The Bionicopter has a wing span of 63 cm, with a weight of only 175 grams. It masters 13 different flight modes.